As part of our charity coffee morning I am delighted to be able to have an auction as part of the fundraising efforts. 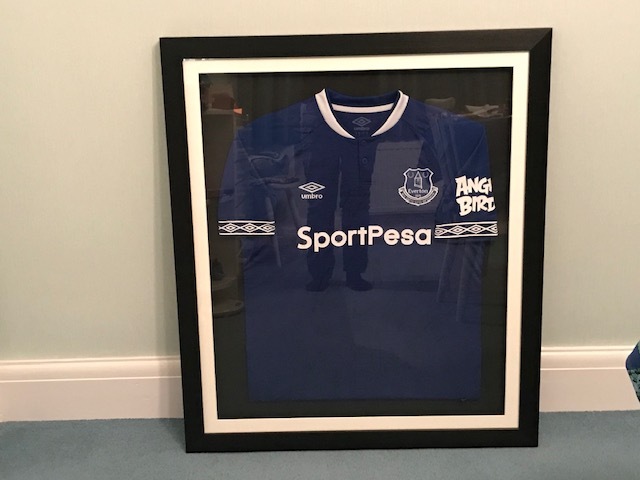 The Everton shirt has been signed by 18 of the current squad and is framed. The photo doesn’t show up the signatures. A huge thank you goes to one of my students who donated this wonderful prize. The auction is now closed. The winning bid was £100. To bid for this item please use the contact form at the bottom of this page to state your name, contact details and your bid. Bidding will take place on Wednesday at the coffee morning starting with the current highest bid. Any online bidders who wish to submit a maximum bid to me must do so by 10am on the 6th February. Your bids will be taken into account during the live bid. The winning bid will be notified and payment will be made through VirginMoneyGiving within 24 hours. Failure to pay within the specificed time will result in the item being offered to the second highest bidder. Once payment is confirmed then winner MUST collect. It will not be posted out.